No doubt Android Phones and Tablets take up more and more market share, and it is said that Android secured a robust 43% global share in terms of tablet and maintained its leadership at 68.4% with regard to smartphones. In other words, more and more users would like to watch their favorite TV shows, movies and take vivid photos with their Android Phone/Tablets owing to its high-resolution display, portable and lightweight body and long-last batter power. If you want to watch some local videos on your Android Phones and Tablets, you'd better know about Android Phones and Tablets supported video/audio formats by default. Read on to find out more. 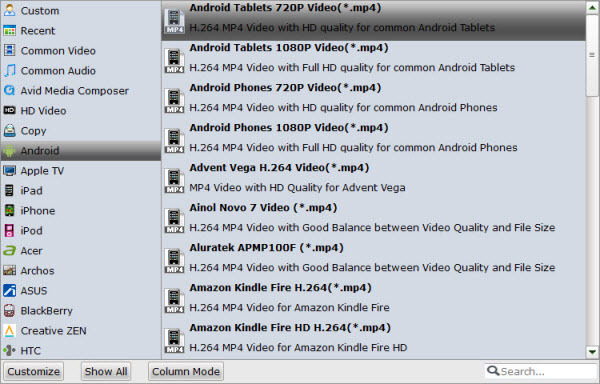 How to Play Unsupported Videos, Blu-ray/DVD Files on Android Phones/Tablets? If you have some 4K/HD/SD AVI, QuickTime MOV, FLV, WMV, MXF, MTS, MKV, VOB files, Blu-ray/DVD movies, and want to play them on your Android Phones/Tablets, you can convert them to Android Phones/Tablets compatible video/audio formats via a third party video converter. To save your time, I suggest you use the all-in-one Video/Blu-ray/DVD converter as: Brorsoft Video Converter Ultimate. With it, you can remove all the Blu-ray/DVD/Video copy protection as well as rip/convert Blu-ray/DVD/Videos to Android Phones/Tablets supported formats without losing quality. Besides, it also provides customized settings for 150+ popular devices and media players including iPhone (8/X), iPad, Galaxy Note8, Galaxy S8/S8+, PS3/PS4, Xbox, and more. It has the equivalent Mac version as Brorsoft iMedia Converter for Mac. Step 1. Install and launch the best Video/Blu-ray/DVD to Android Converter, simply click Load File to load your videos or click Load Disc to import Blu-ray/DVD movies to the program. Step 2. Click Format drop-down menu and go to Android category to pick up your desired output formats. Besically, Android Tablets 720P Video (*.mp4), Android Tablets 1080P Video (*.mp4), Android Phones 720P Videos Video (*.mp4), Android Phones 1080P Videos Video (*.mp4) are compatible with most Android devices. Step 3. When all the settings are OK, tap Convert button to convert Videos, Blu-ray/DVD movies to Android Phones and Tablets supported file formats. After the conversion, you can click Open to get the result videos, then connect your Android devices with PC via a USB port and transfer the converted files to it. Now, you're able to watch the converted Videos, Blu-ray/DVD movies on Android Phones and Tablets anywhere, anytime.